Reinforces the strength of your Microsoft Surface Pro 3 or Surface Pro 4 screen while maintaining its original appearance. Strong tempered glass with anti-shatter film for optimal safety. Treated in a bath of potassium salt at more than 300º C / 572º F causes sodium ions in the surface of the glass to be replaced by potassium ions, making Compulocks DoubleGlass tougher than common glass. Compulocks DoubleGlass can withstand up to 60 kg / 132 lbs of weight by bending before safely breaking! Compulocks DoubleGlass has the highest rating in the Pencil Hardness Scale! The resistance of a coating is determined as the grade of the hardest pencil that does not scratch the coating when pressed firmly against it at a 45 degree angle. 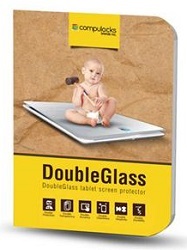 With Compulocks DoubleGlass protection, touch screens resist scrapes and last longer! Nano-coating resists oil, dirt and fingerprints. Compulocks DoubleGlass is treated with a special hydrophobic Nano-coating, creating an easy-to-clean, smudge-free surface that repels water, dust, oil and dirt. Also used on eyeglasses, flat panel displays and stainless steel, this coating ensures that Compulocks DoubleGlass stays sparkling clear! Invisible, super-clear glass is optimal for HD smart displays. Compulocks DoubleGlass is carefully treated and polished, much like optical lenses, to intensify the clarity of HD smart screen displays, improving the brilliance of each and every pixel of a 1080 pixel display. The screen image will remain crisp, clear, and detailed, enhancing the visual experience of HD. Highest quality glass optimizes touch-screen responsiveness. The exceptional thinness of Compulocks DoubleGlass preserves the high sensitivity and accuracy of touchscreens, ensuring their responsiveness when using today's most advanced touch applications. Engineered for performance and ultra clarity, Compulocks DoubleGlass maintains rapid conductivity enhancing the user's screen interface.